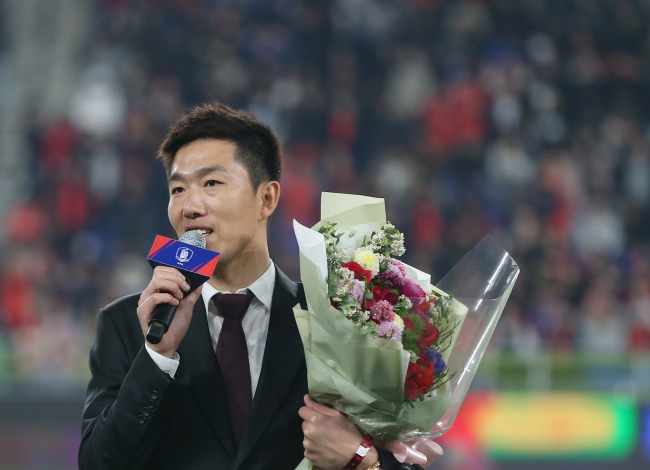 Former South Korean midfielder Kim Jung-woo received a warm reception at his retirement ceremony on Friday as fans gave a standing ovation for his service to the national football team. Kim officially bid goodbye to his playing career and thanked fans for their support in his retirement ceremony prepared by the Korea Football Association (KFA) during halftime of the men's national football team friendly against Bolivia at Munsu Football Stadium in Ulsan, some 400 kilometers south of Seoul. Entering the pitch with his wife and two children, Kim first watched a video of his past national team performances and received a plaque from KFA Vice President Cho Byung-deuk. "It remains a happy memory for me to play a match with the national team jersey," Kim said. "Although I can no longer show my performance on the pitch, I will do my best to meet fans with better work. I hope fans can give more support to South Korean football." A hardworking midfielder, Kim, 36, made his international debut in October 2003 and went on to score three goals in 71 matches for South Korea. He was pivotal for South Korea's knockout stage run in the 2010 FIFA World Cup in South Africa. He started all four matches and helped the Taeguk Warriors reach the round of 16. Kim also represented South Korea at the 2007 Asian Cup and 2010 Guangzhou Asian Games. He also helped South Korea reach the quarterfinals at the 2004 Athens Olympics and competed at the 2008 Beijing Games. His last appearance for South Korea was in a friendly match against Zambia in August 2012. Kim, who made his pro debut in 2003 with Ulsan Hyundai, ended his playing career in 2016 after having a stint with Thai club BEC Tero Sasana. He was recently appointed head coach of Incheon United's youth club. Since 2002, the KFA has been staging retirement ceremonies for footballers who played at least 70 matches for South Korea.